Surprise! Grandfather was adopted; double genealogy. Dearly departed collude in his dual reveal, through crumbs laid long ago, in their records of life. They cast lifelines, but throw a wrench; his unrelated, same aged, adopted cousin. A manual: "who done it" and "missing person" searches in loving discovery. Surprise adoptee, Grandfather was a coal picker in Scotland, at 29, and Chief Inspector of Mines for British Columbia, at 43. He had shared his date and place of birth, or so, it seemed. 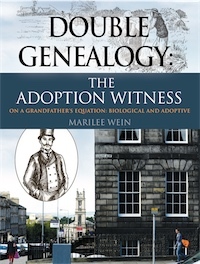 This genealogy embraces late 18th to early 20th Century, Scotland, with US implications. His family is lovingly presented in “who done it”, under evaluation, as his potential birth parents. His dearly departed are drawn to present, fulfilling adoptee yearn for natal truth. They join “missing person” searches, through crumbs laid long ago, in their records of life. Their whispered lifelines include a wrench; a same aged, unrelated, adopted cousin, awaiting discovery. Old fashioned story weaving substitutes for DNA certainty, as eliminations ensue. The road to data discovery and conclusion is superimposed upon the narrative. Accuracy of selection is left to reader speculation, while threat of an undisclosed record of rebuttal, ever haunts. Author despair and triumph, over mighty data struggles, is disclosed throughout. Ancestors meld facts into a family tale, consistent with the beloved man, Grandfather would become. They were genial people, with toil in the content of their day. They thread the needles that wove the fabric of Scotland, as the Industrial Revolution unfolded. Marilee Wein (Hemmingsen) grew up in logging camps and small towns of Canada’s Vancouver Island. She currently resides in South Side, Chicago. Her family consists of two daughters and five grandchildren of various faith, race and culture, as well, natural, step and adopted. That nurture is nature’s love, her notion of experience, resonated on writing her grandfather’s history. By surprise, he was found of a double genealogy; adoptive and biological. The author is a pharmacist by background, who had engaged in clinical research in mid-Manhattan’s pharmaceutical industry. She set her data skills to the task of discovering both sides of his life’s equation.